This support note will explain how to connect and update your MYOB company file to the desktop client version of Calxa, and briefly discuss Calxa terminology. If you are using MYOB AccountRight please refer to Connecting and Updating: MYOB AccountRight. Note: MYOB Classic files are not supported with a Calxa online workspace. You must use an online accounting file with an online workspace. 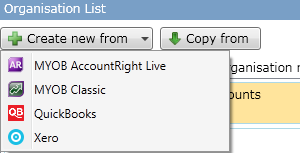 Click on the Create new from drop down button and select MYOB Classic. When Calxa has finished importing your company file you will receive a message telling you that the organisation has been successfully created. Simply click the Close button to finish. Calxa broadly refers to cost centres including the organisation as Business Units. On your initial import Calxa associates MYOB categories as departments and jobs are imported as projects. You may, however, manually change the terminology settings – for more information on this, please refer to the support note – Understanding Calxa Business Units and Budget Versions. Select the organisation that you want to update from and click on the Update button. 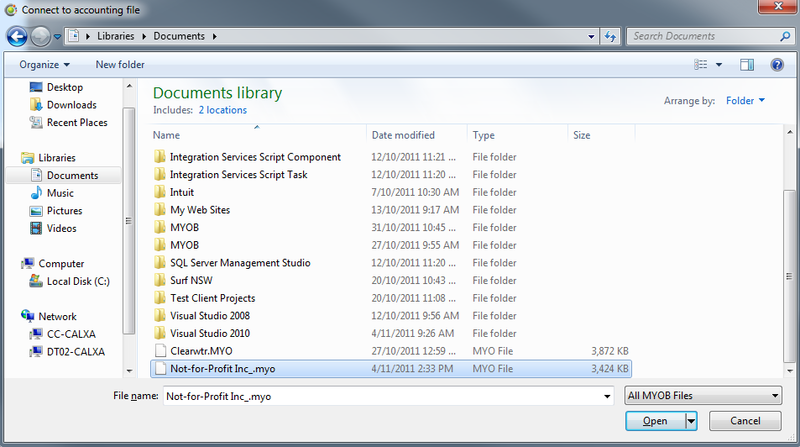 However, if your data file no longer exists in its initial directory, use the Browse button to select your company file. When Calxa has finished updating your company file you will receive a message 'Data was successfully updated.' Click Close to finish.